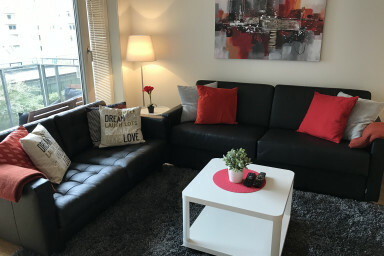 This modern apartment with space for 6 guests, has 1 bedroom, a living/dining room area with 2 sofa beds, balcony and a fully equipped kitchen. This accommodation by Sonderland Apartments has 1 bedroom, and a living/dining room area with 2 sofa beds and flat screen TV. There is space for 2 people in each sofa bed. They are high quality and have normal bed mattresses. One is 160 cm wide and the other is 140 cm wide. The apartment has an open kitchen equipped with utensils and tableware, a stove top, an oven, a fridge and freezer, a dishwasher, a toaster and a coffee machine. The bathroom has a shower and is equipped with a hair dryer, an iron, a washing machine and a tumble dryer. It has a balcony with a small seating area and an elevator. There is free Wi-Fi, and linens and towels are included. The Oslo Bus Terminal is a 5 minute walk away and it takes about 10 minutes to walk to the main train station. The subway station, tram and bus stops are a couple of blocks away, as well as cozy cafes, restaurants and the supermarket. Karl Johans gate, Oslo's main street with restaurants and shopping, is a 15 minute walk away.